It’s hidden. It’s hidden very well. And it needs a couple of detours to get to the point where you can actually select various keyboard layouts. But if you hate the Kindle’s English „Quick Fixes“ so-called „feature“ as much as I do, it’s really worth the effort. 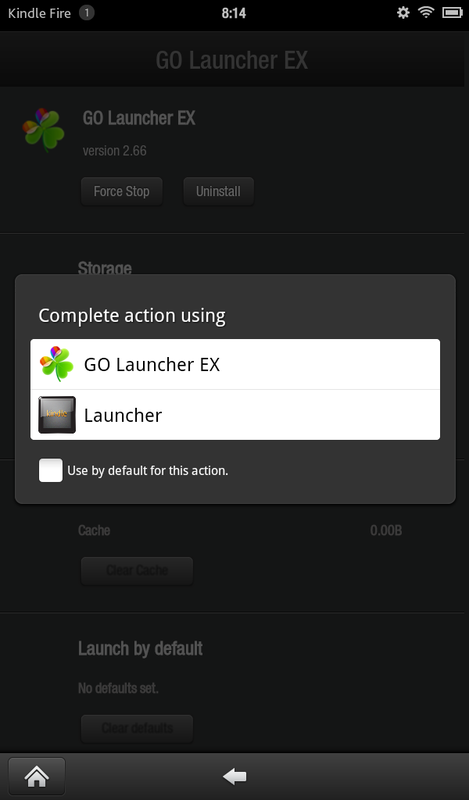 Let’s start with installing Go Launcher EX (it’s free). It works like charm on your Kindle Fire. When you hit the „Home“ button, you will be able to select whether to run the regular Kindle Launcher or GO Launcher EX. For the time being, I’d recommend to use it as a default – you can change back later at any time you want inside the app settings. Now install AnyCut (it’s also free). 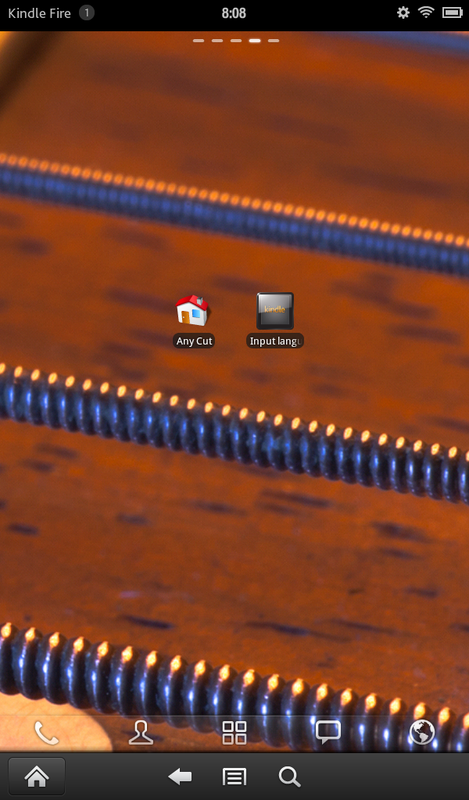 AnyCut is meant to create launcher shortcuts to often used functions that are hidden deep in menu structures. Some of the shortcuts you create won’t work or might even lead into a „Force close“, but if you find the right one, it’ll save you a lot of time. It’s as simple as that: Start „AnyCut“, select „New shortcut“, then „Activity“ – and the „Input languages“. This is how it is supposed to look like. And now tap the „Input languages“ shortcut. As you can see, there are lots and lots of different keyboard layouts! I assume these are all those keyboard layouts that Android 2.3 „Gingerbread“ actually supports under the hood, which Amazon was so kind to hide from our curious eyes. Yay! That’s how it looks like when you’re typing in German! As it’s supposed to, the German keyboard supports the usual umlauts, and the space bar is really, really in the middle of the screen. … And note: If you’ve selected more than just one keyboard layout (as seen in the screenshot above), you can simply swipe the space bar to right or left to switch between them whenever you like. Ain’t this cool? 😉 — Remember: You read it here first! Fertig: Es werden verschiedenste unterschiedliche Tastaturlayouts unterstützt. Wenn man mehrere auswählt, kann man später auf der Leertaste nach links oder rechts wischen, um im laufenden Betrieb das Tastaturlayout zu wechseln. Immer dran denken: Das habt hier hier zuerst gelesen! To install the very versatile file manager „OI“, please go to http://openintents.org/en/filemanager with your Fire’s regular web browser and download the .apk file. It should be enough to tap the finished download (the notification in the upper left of your screen) to reach Android’s app installer to install it. From there, you should be able to access OI to traverse your filesystem to install .apk files that you’ve copied onto it via USB. Adding additional apps that Amazon doesn’t want you to have is a bit trickier. The easiest way is to find their .apk installation files on the web. Some Android app portals provide just that for well known apps – in Germany we’ve got http://www.apkmarket.de/ where you can search for apps and download them just like we did with OI in step one. One very important app you would want to have is Dropbox. You can find its APK file at http://www.apkmarket.de/dropbox/. This way you can get files to your Fire through the cloud without even bothering about hooking it up to you computer via USB. However, a lot of apps are not available like this. If you don’t have access to the Amazon Appstore (like me), or if a particular app is not listed there, or (even worse) if it is, but Amazon claims that it’s incompatible with the Fire, you’re kind of screwed. The very versatile „GO Launcher EX“ program launcher (an alternative app launcher that will make your Fire look and behave like a 7″ Android phone – we will be needing this later on) is a good example for this: Amazon reports it to be incompatible – which it is not, it runs nicely and smoothly on the Kindle. To get apps like this onto your Kindle, I recommend to take just any other Android phone with access to the Google Marketplace (I’ve got a $100 Huawei Ideos X3 which works just fine). Install any app you want to transfer to your Fire to that other Android phone of yours. Be sure to also install „Astro File Manager“ (the free version will do). Here is where the magic starts: Astro can create backups of (most of) your installed applications. It sure does not backup your user data (like settings, save games, stuff like that), but at least you can backup an app to gain an .apk file for personal use. After you’ve backed up the apps on your regular Android phone, simply transfer the resulting .apk files over to your Fire. You can choose if you do it via USB, or via Dropbox (which I told you would become handy to have). I guess, from here you can follow the illustrated description above: Install „GO Launcher EX“ and „Any Cut“. Then create a shortcut to the hidden menu item „Input languages“, tap it – and you’re done. your article was very helpful, but if you select german the button to dismiss the keyboard ist not available. i had this problem because i converted my kf to german by setting the language in build.prop in the system directory from US-en to DE-de. you get a nearly complete german kf, but the downside was that i had always the german keyboard. with your method we can set the keyboard to english again and have the needed button. there are even more characters available in the english layout by holding the buttons. It actually depends – I meant to create a couple of screenshots. On occasion, the German keyboard comes with the „Hide keyboard“ button, often it doesn’t, sometimes it even shows up with the lower row missing, ie. without a spacebar, without the Shift/Alt. The latte one often happens in Opera Mobile. Closing the keyboard is simple, though: Simply tap the upper right of the screen (to get the QuickSettings pane), tap once more to close it – and both the pane and the keyboard is gone. with the DE-de method all my self-installed apps switched to german language and the best of all: the android market switched to the german one. Come again, please: Does the DE-de patch in build.prop require rooting? Thanks to Gero for discovering this! Hi Yakov – yes, indeed. Sorry, I haven’t had the time to promote this more prominently in the blog post. yes, the DE-de patch requires rooting. but it is a realy simple process. there are a lot of descriptions on the web. i recomend xda-developers. for changing the market to de you have to delete the cache: after importing or changing the build.prop start the market – change to running apps (don’t close the market) and delete cache then force close. then look for the googleframework app and delete data. if you start the market now you get an server error – this is ok ! reboot the kf now. after reboot goto android market – it asks to agree using the (german)market (in german) and it’s done. if you need more information, i’m at your service. For the time being, I prefer the device non-rooted. Unlike seemingly a lot of people who root their devices as some kind of sporty endeavour, not to say criminal energy, and while having jailbroken both iOS and Android devices myself for good reasons at some point in the past, I believe that I’ve outgrown this childish hobby to „pwn“ a device. 🙂 But thanks for the input. you can unroot it after the process – it stays german anyway (till the next os-update). Hallo! Ich bin nun auch ein Fire-Besitzer. Aber ich wollte nun GO Launcher EX und anderes bestellen. Aber die Website sagt immer ich hätte kein Devices. Wie kann ich das umgehen bzw. wie bekomme ich mein Fire da angemeldet? Du kannst mit dem Fire nicht von Deutschland aus auf den Amazon Appstore zugreifen. Du musst zuerst aktivieren, dass Du Apps auch aus anderen Quellen installieren kannst, und kannst dann anfangen, Apps aus dem Web herunterzuladen – aus aus Deiner Sicht vertrauenswürdiger Quelle als .apk-Datei. Schau einfach mal hier. Anschließend kannst Du Apps von einem anderen Android-Handy mit Hilfe von Astro sicher und via USB oder per Dropbox auf den Fire rüberkopieren und auch dort installieren. Is there a way to do this without Go-launcher? I tried installing this app, but it froze my Kindle and I couldn’t get it to work again – tried resetting it and plugging it into my computer, nothing – so I had to return it and get another. Needless to say, I really don’t want to try and install that program again. If you know of another way, I’d love to hear it. Hi Victoria – I’m sorry to hear this. Fact is: I’m using the Go Launcher EX like all the time, I only switch to Amazon’s official user interface only to demonstrate it to friends. I don’t think this is the main reason — we’re not rooting here so we could overwrite crucial system files. We’re merely installing an app, certainly not malware — so if an app doesn’t work properly, it should force-close and this is it. You could then simply uninstall it again, no harm done. Ohne geht’s nicht – an der Stelle hilft Dir MyUS.com. I also read in other blogs that in some cases the Go-launcher ‚killed‘ the Fire and the Fire had to be returned to Amazon, because it could not be recovered. Why do you need the Go-launcher for running AnyCut ? I’m receiving my Fire tomorrow here in Germany and would have no chance to return it to Amazon in US and get a new one…. I have no explanation whatsoever how a non-malware app could brick a non-rooted device. Anyways, please have a look at my reply to Victoria above (9. Dezember 2011 um 09:29) – it contains a link to Yarkov app that opens the keyboard layout selection panel without using AnyCut (which requires a different app launcher). Which version of the Go-launcher did you install on your Fire ? 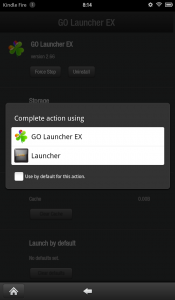 Just upgraded to GO Launcher EX 2.6.8 – no problem at all. Anycut is not available anymore in the appetite. Can you help with a source hto download it? https://market.android.com/details?id=com.appdroid.anycut … in case of doubt install it on some other Android mobile, backup it with Astro and transfer it to the Fire via USB or Dropbox. I got my Fire now in Germany and set it up with the help of Geros blogs. It works fine. Gero, thank you again! it was kind of a pain to do the whole „amazon run-around“ but I finally got it to work without a problem. very awesome! Hey thanx for.all the info..very helpful..I would.like to.know.if.on.a kindle fire I can also change language itself so that the instructions itself.are.in Spanish for example..please let.me know..I would appreciate it. I heard the rumour that it’s possible to switch a Kindle Fire’s overall language, but only on a jailbroken device – which, at the moment, doesn’t seem to be possible when using firware v6.2.1. … I never jailbroke my device, so I can’t tell you for sure. Both Yakov Shafranovich’s app and my AnyCut shortcut to the keyboard language dialog displays only those keyboard layouts that are already installed. If Korean isn’t in it, there’s no way to add it. The installed keyboard layouts are those included in the modified version of Android that Amazon ships with Fire with. Sorry! I follow your post from the amazon page and the GO Launcher also frozen my Fire. Any ideas on how to fix it? I have trouble installing anycut……also do you have a recommendation to a website that tells you hie to reboot your kindle fire? I’ve transfered AnyCut from my Nexus One without problems. 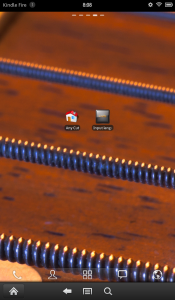 It of course requires an app launcher with home screens to install the shortcut icons to. Re- reboot: You won’t find such a program, not without rooting. The shutdown sequence can only be triggered by root code, e.g. with that particular piece of program that is run when hitting the standby button. I.installed the go launcher and went to the language settings and changed it to Korean but i cant seem to type in it…. Some keyboard layout seem not to be present in the current Fire firmware. I know that the German keyboard layout works fine most of the time, but sometimes shows up with only three rows of keys. I guess that’s why Amazon hid this option, as these keyboard layouts might partly be incomplete. I updated to GO Launcher 2.71 without any problems (the Icons are bigger now, which is not too bad on the 7″ screen). But I always cross my fingers, hoping for the best, before I push the ‚Install‘ button. Would be good to find a pattern, why some Fires crashed with the GO Launcher. I always use Dropbox with a backup file from my Ideos X3, created with Astro. My last update actually came from the AndroidPIT App Center – an alternative market application that you can download and install from here. It’s a usable alternative for the Google Marketplace – it hasn’t got all apps, but it’s got a lot of them. Has anyone found a solution to reactivate the Fire, when crashed with Go Launcher ? I’d also love to see a Fire that got bricked liked this – although I’d really prefer if it wasn’t mine, if you know what I mean. 😉 I just received the GO Launcher EX 2.71 via AndroidPIT, and it went through safe and sound (except for the „Giant Icons“ issue – although, my 6×6 grid is still working quite nicely). As I’ve said before, and as I will always repeat saying when being asked: I have no idea how a non-malware app coming from a secure location (either from the developer’s website or from AndroidPIT or as an Astro made APK from another Android device) can „freeze“ a device. On the other hand, I’ve heard of faulty Kindle Fire devices that had problems with their touch screens and other abnormalities. So – my guess is: If you get such a lemon, it’s only a matter of time until it will die on you. But I keep thinking: Now I’ve got it up and running, and GO Launcher EX is running smoothly, how should a later update „brick“ the Fire? I tried all the methods – changing en-US, GO Launcher EX and Anycut as well as the other one-app-method. Latvian keyboard still does not work on my Fire although I did set it as the only input language. You mean – just from switching to the Latvian keyboard, the Fire switched its system language? Or is this something you did after rooting? It works on my Kindle Fire to a degree. I got Anycut installed and found the other keyboards, although the one I wanted wasn’t in there (Chinese). I chose an alternative language and tried to write something with it, but I only got an option for the Kindle Fire keyboard. My Fire is rooted. Wait, I just noticed something is different. It says Espanol on the space bar! I think I have to play around with it more. Ok, I see now. Hold down the key to find the other characters! Nice one. Thanks Gero Zahn. Why no chinese ? I hate amazon ! I cant download the apps. It says my device is not compatible. Is there a work around? In that case the simple most solution is to install them on some other Android handheld, then backup them with Astro File Manager, and transfer the resulting .pkg installer files from the other device to the Fire – at first via USB, later probably via Dropbox. To execute .pkg files, you need two things: (a) Make sure that the Fire accepts .pkg installers from other sources. You find this option in the settings menu under „Device“ (IIRC). (b) You need a simple file manager to traverse your files, so you can tap the .pkg file to install it. A good starting point is OI – Open Intent File Manager: http://openintents.org/en/filemanager … Simply download the .pkg file from this website and open it. If you have activated .pkg installation from other sources, it should install. Afterwards you can look into you file system and tap any .pkg you copied onto the device this way or another. Das ist wirklich großartig! Super Lösung. Meine Empfehlung: Installier einfach DropBox auf dem Fire, von hier: http://www.apkmarket.de/dropbox/#more-817 Einfach das .apk antippen – sofern Du die Installation von Apps aus anderen Quellen zugelassen hast, funktioniert DropBox hinterher sofort. – Auf die Weise bekommst Du anschließend im Umweg über die Cloud jede beliebige .apk-Datei von einem Android-Handy auf den Fire. … Hope that helps. hi there, thanks for everything, i did all of the steps but unfortunately i found out there was no Arabic in languages, would you please help me what i should do, thanks. Sorry – I’m afraid I can’t help you. The method I found doesn’t actually add keyboard layout, it simply shows a way to select between those that are already installed in the Android system that Amazon pruned, and not even all of them are working properly. So I guess if you need Arabic, you will need to root your device to add support for this. I can’t help you with this, I never did that. Wow, cool! Hat super geklappt. Und ich dachte schon, ich müßte auf ein Firmwareupdate warten oder ein Jailbreak durchführen. Außerdem ist der Hinweis mit dem APK-Market sehr zu gebrauchen, der Amazon-App-Shop verlangt ja selbst bei Free-Apps einen Account mit Adresse. Das funkelniegelnagelneue 6.3er Firmware-Update kann endlich die QuickFix-Funktion abschalten. Coole Sache. Ich danke dir. Habe alles installiert, aber frage mich, wieso hat das eigentlich funktioniert? Was macht die App Go Launcher und AnyCut? (Will nur verstehen, was ich gemacht habe). Den genauen technischen Zusammenhang kenne ich leider auch nicht, ich bin kein Android-Programmierer. Meiner Kenntnis nach sind sämtliche Menüeinträge, so genannte „Activities“, einer App und auch des Systems registriert und können anderweitig aufgerufen werden. Beispiel: Eine App kann eine URL aufrufen, und dann öffnet sich der Default-Browser, ein Druck auf „Back“ führt zurück zur normalen App. Das heißt, sämtliche auch tief verschachtelte Funktionen kann man theoretisch auch auf dem kurzen Dienstweg aufrufen, sofern man eine App hat, die exakt diese Activity aufruft. AnyCut (und andere Tools dieses Genres) machen sich das zu Nutze und produzieren Homescreen-Shortcuts, die nichts anderes machen, als eine selbst gewählte Activity aufzurufen. Der Trick ist nun, dass Amazon bei der Modifikation des Android 2.3.x zum Kindle Fire OS zwar verschiedene Masken entfernt hat, die Activity zur Wahl des Tastaturlayouts aber im System belassen hat – streng nach dem Motto: Wenn kein Menüpunkt dorthin zeigt, kann ihn ja auch keiner aufrufen. Falsch: Mit AnyCut & Co. kann man sich sehr wohl einen Shortcut dorthin generieren. … Reicht Dir das als Erklärung? Could I write in modern greek (elliniká)? I have install Anycut, I create a shortcut, but I do not see where it is now. Please, could you explain to me? Thank you in advance. You can write only in those languages that are supported and afterwards hidden. If you use Go Launcher, AnyCut should be in your App Drawer. Not sure, but my guess would be you can’t. You can only activate those keyboard layouts that the firmware supports, and most of them are incomplete. Sorry! I just got a fire in the US for my 9 year old niece. your instructions a’re just what I need‘ to fix thecsthe Swedish keyboard and get rid of the ads and get her favorite games onto the kindle. so I am happy and thankful to find the solution! my problem is that go launcher downloads and installs but doesn’t open. anyway and ios works fine, meaning the open and show in apps when done. my question did I miss one step or do you have any idea what I am doing wrong? 3. Got the DroidSans Thai keyboard from the Google Playstore and installed it on the mobile. 4. Started the Astr file manager and made a backup of the droidsans thai keyboard. A bit hard to find: whipe the screen to left, select application-manager, select the droidsand thai keyboard and back it up. 5. Find the backup file (an apk) in the directory /sdcard/backup/apps, press it and hold it down for a menu to open, then select share (teile), select dropbox. Now the file will be uploaded to the cloud. 6. Now take the Kindle, open dropbox and download the file, that you just have uploaded. It will install on the Kindle. 7. Whipe from up to down on the kindle and a menu will open. Select „more“ . Find the Language and keyboard option, then keyboard, then standard. Now, you can select the DroidSans Thai Keyboard as a standard. Maybe it is also possilbe to just email the file and don’t use dropbox. I haven’t tried it, yet. It is also possible to install other apps like this. It works with some, but not with all. In case there are apps for other keyboard, I would try it in the same way. 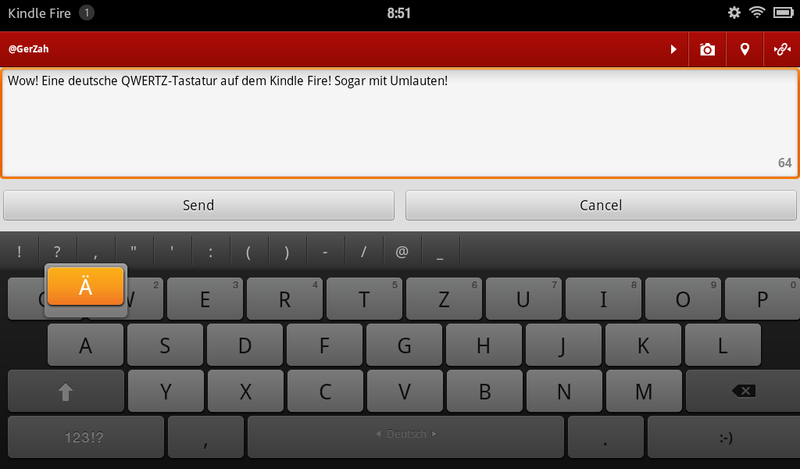 for Kindle fire hd, hold down „Space“ on keyboard, you’ll see „select keyboard language“ window. I do not have android devices, only Apple,iPhone. How do I proceed to get GO launcher ex and antics? Trying to get bulgarian keyboard – it was so easy on iPad..
That’s gonna be hard, as side-loading requires having a Google Play capable Android device from where you can backup your installed applications to transfer the installer .apk files over to your non Google device. Some apps can be downloaded as .apks straight from the internet, but you’re always at risk of getting infested ones, as they didn’t pass through the official channels. Unless you are really sure about the source where you get the .apk, I’d strongly advise against it. Kindle fire hd is my device.